Our thousands of satisfied customers trust Sludgebusters to always provide an accurate appraisal of the functionality of their Ramona home and business septic systems, as well as an honest estimate on the most cost-effective solution to remedy any problems we diagnose. Sludgebusters is the undisputed industry leader in providing San Diego County with high quality, affordable septic system pumping, repair, inspection, location, sales, and installation services, and performs these services for residential and commercial customers of every size: At Sludgebusters, we service both single family residences as well as large, industrial clients like sewage treatment plants and municipal water districts, and every size of business in-between. Sludgebusters has a 90% customer retention rate for a reason: We offer honest estimates coupled with high quality workmanship, making us the best value in San Diego County residential and commercial septic system services. In addition, all of our Ramona clients appreciate the fact that they can rely upon our state-of-the-art pumping and cleaning technology for regularly scheduled maintenance as well as in emergency situations, twenty-four hours a day, seven days a week. At Sludgebusters, Our Ramona residential and commercial clients appreciate that we are providing them with the highest quality maintenance services possible for their septic systems. The pumping and cleaning process we observe is comprehensive: We pump out both the primary and auxiliary tanks which make up the septic system, thoroughly eliminating both the solid and liquid waste from the septic tank. At Sludgebusters, we follow this process because it is the only way to ensure the optimal health, functionality and maximum lifespan of your home or business septic system. We also provide emergency pumping services, and are on call 24 hours a day, 7 days a week to handle any and all septic system complications which occur for our valued Ramona customers. Please call us with any concerns you may have about your home or business septic system. 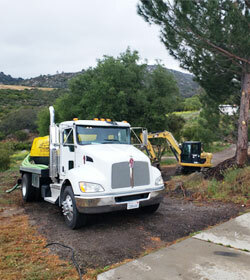 At Sludgebusters, we hold a Class A General Engineering contractor's license, and provide the most comprehensive, full-service septic system repair services available to our Ramona commercial and residential clients throughout the greater San Diego area. We specialize in both repairing and upgrading existing commercial and residential septic systems, and can increase the overall capacity of your existing system by the addition of supplemental tanks. In addition, our highly skilled technicians will always honestly assess your septic system's functionality and only suggest the most cost-effective maintenance and repair services, to keep your system operating smoothly. At Sludgebusters, our dedicated technicians can provide full-service septic system repairs: We can perform tight line repairs, and can also replace worn leach lines and outlet fittings and add additional leach lines to your system if necessary. 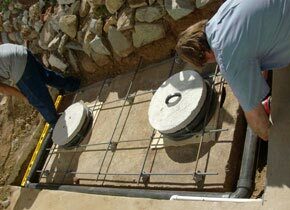 We can repair or replace septic tank risers, and can also demo and replace the concrete layer which exists over your tank, reinforcing its structural integrity. Call us today with any questions you may have. Our valued Ramona customers appreciate the fact that we use only the highest quality materials available, and always conform strictly to all applicable UPC and municipal codes. Sludgebusters is licensed, bonded, and fully insured. In addition, our expert Ramona installations are performed completely in compliance with the UPC and all applicable municipal codes, and comply fully with all current environmental standards. 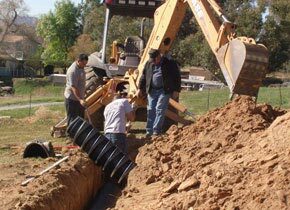 Also, when your current home or business septic system requires increased capacity, we are able to install additional tanks and/or extend existing leach lines, providing a much more affordable alternative to the installation of a completely new system. Moreover, all of our existing septic system modifications are expertly designed to maximize the lifespan and long term efficiency of your septic system. Septic system inspections and certifications are required by law whenever a residential or commercial property containing a septic system is sold, and Sludgebusters has decades of experience applying its septic system expertise to performing Ramona commercial and residential septic system inspections and certifications. At Sludgebusters, we help San Diego County home and business owners in meeting this requirement in the most cost-effective manner possible: Our knowledgeable inspectors will recommend only the most essential repairs and maintenance needed to meet certification requirements, and work closely with our valued customers to make sure that they completely understand the need for any necessary maintenance and repair services. Sludgebusters has provided Ramona home and business owners with competitively priced septic tank location services for decades. Because we use an electromagnetic locater, the most modern tank location technology available in the sanitation industry today, we possess virtual certainty that we will be able to successfully locate your septic system. 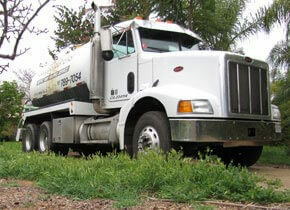 Let Sludgebusters help you locate your residential or commercial septic tank, so that it can be properly serviced. 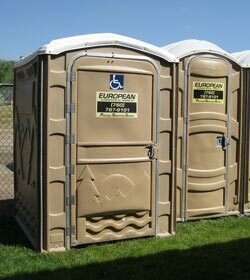 In 2000, we acquired European toilets, and since then, by combining their rental services with Sludgebusters' septic services expertise, we have raised the bar on portable toilet rental and sanitation services throughout San Diego County. At Sludgebusters, customer satisfaction is of the utmost importance to us, so we meticulously sanitize, pump and restock the supplies in our portable restroom units on a very strict schedule, so that entering our portable restrooms will always be a pleasant experience. 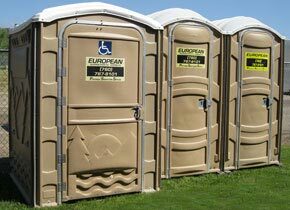 We provide a wide selection of top quality, affordable portable toilets for short and long term rental, as well as for permanent placement, for both commercial as well as residential use throughout San Diego County. In addition, we also offer group discounts, making our portables the best value for Ramona business, private, community, and recreational events requiring several units. 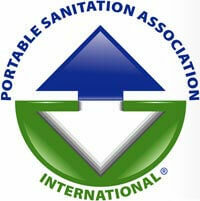 Please call us today to reserve your portable restroom unit(s) for your jobsite or special event. 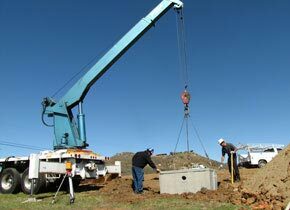 Contact us with any Ramona home or business septic tank system concerns you may have, and learn about our high quality septic system services at affordable prices. My neighbor and I just had Peter from Sludgebusters pump out our septic tanks. Great service, knowledgable, courteous, quick, clean and a good price. If you need your septic tank pumped, these are the guys. I highly recommend them.